In our last episode of All My Puppies, we left Pippin in labor (poor thing), with all of us wondering how many puppies there would be. Okay, seriously, let’s take stock of the situation: this is a young pregnant mama who was kicked out of her house, and we don’t know where she is from or who the father is. If some boy dog shows up at our house claiming he married Pippin in secret but then disappeared because of amnesia due to an accident when he tried to fake his own death, I’ll KNOW we are in a soap opera. So, labor. Pippin went into labor around 3:00 p.m. We spent the afternoon and evening making sure everything was as ready as it could be while also doing homework, making dinner, and trying to carry on with life. We wondered just how long Pippin’s labor would last. We also kept speculating how many puppies?!? And what will they look like? At that point, my daughter said it felt like real-life Puppy Surprise, which is a somewhat creepy stuffed animal toy where the surprise is, “Will there be 3, 4, or 5 puppies?” You pull the little babies out of the slit in the mom’s belly to find out exactly how many were in there. This is apparently a popular toy. Here’s the link to Puppy Surprise on Amazon if you’re curious to see what the toy is like. It’s an affiliate link, which means that if for some reason you actually want to buy one of these things, Amazon will chip in a few coins to help us pay for the astounding amount of food Pippin is eating these days. Pretty soon, it was apparent that labor was ending and delivery was about to begin. Cue dramatic music. Actually, I will skip over most of the delivery for the sake of everyone who’s squeamish. Dramatic music stops abruptly. Let me just make this observation: human moms usually have some combination of nurse, doctor, midwife, doula, and/or husband to help them with all the… “intricacies” of bringing a new life into the world. Pippin had Pippin. (I mean, I was prepared to intervene if necessary, but I really don’t know that I would have been much help.) Canine mamas have to work hard to make sure each pup is clean and breathing after its arrival, and as soon as she’s done with one, it’s time to birth the next one. Props to you, dog moms! 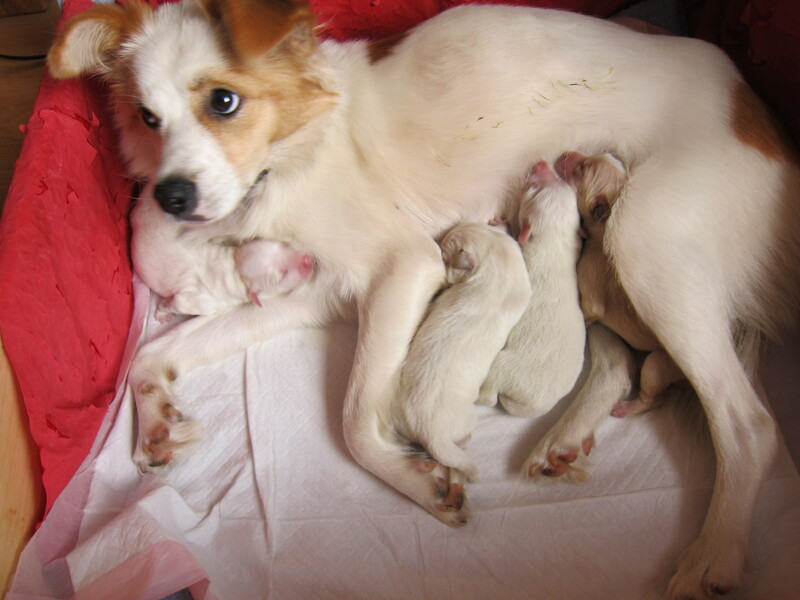 Anyway, the fast-forwarded version is: by 12:15 a.m., Pippin had successfully delivered three puppies! It was amazing to watch, friends. We were so excited with each little one’s entrance into the world, and captivated by them. The best was hearing their impossibly small voices make tentative coos and peeps. How are they so cute?!? After a while of nothing happening (with me Googling “how do you know if your dog is done giving birth?”) we decided three was the magic number. Time to get some sleep after an eventful night. You’d think this is the end of the story, BUT WAIT, THERE’S MORE! 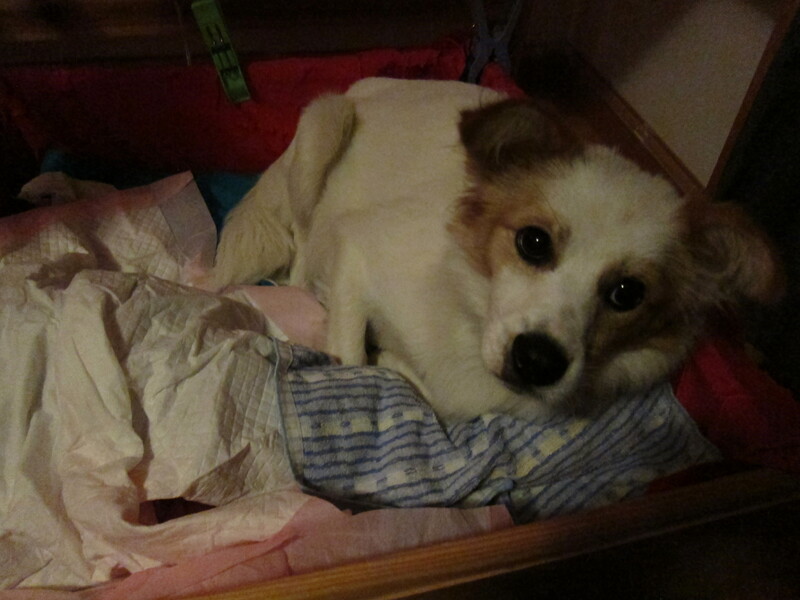 At 2 a.m., I had finally decided I needed to see what was going on down there in the whelping box. Maybe I could help Pippin out? Convince her that the puppies were as clean as they needed to be? I grabbed my phone and turned on its flashlight to check on the mom and litter. Lo and behold, there was another puppy!! That explained the continued licking. Sadly, puppy #4 seemed very listless. I remembered that puppy #2 had also seemed weak right after birth, but Pippin’s vigorous attentions plus a nursing session had revived it. I tried rubbing #4 (is everyone else also imagining the scene in 101 Dalmatians? ), putting it in front of Pippin for her to lick (which didn’t seem to work), putting it next to (ummm…how G-rated do I need to keep this?) a milk source, but it still seemed…lifeless. And then, by the light of my cell phone, I saw why Pippin was not paying much attention to #4. She was giving birth to puppy #5!! I was astounded that scrawny little Pippin had had five puppies in her belly. No wonder she looked like she was going to burst! Pippin finished cleaning the fifth puppy and then seemed to finally settle. From her behavior and from the sheer improbability of there being another puppy on its way, I decided she was finally done delivering. So, the answer to our Puppy Surprise was **5**. Wow. That is a lot more than 1 or 2. But, sadly, the litter of five included four puppies nuzzling and nursing their exhausted mama, and one puppy lying very still. I wasn’t sure what could be done for poor little #4. In fact, although I didn’t want to admit it, I was pretty sure it had already died – perhaps from the strenuousness of birth – but I wasn’t ready to give up on it quite yet. It was hard to get a good look at the puppy since all I had to combat the total darkness of the power outage was my cell phone light, and the battery of my phone was about to give out. I decided the best nurse was the puppy’s own mother. Perhaps with the warmth of its siblings and some more licking and nudging from mom, the pup would gain energy and prove me wrong. With that thought, I crawled back into bed. It was around 3:00 a.m., and the power came back on, helping me go right to sleep. And then, quicker than I would have liked, my alarm was going off at 6:00. Time to start the day. You can bet that the first thing I did was to check on puppy #4. In the light of morning, I could confirm what I had feared a few hours previously: puppy #4 was indeed dead. It was a sad contrast to the four squirming babies cuddled up to Pippin in the whelping box. But of course, the live babies were where the attention of Pippin necessarily had to lie. Human moms have it relatively easy when it comes to taking care of newborns, if you can believe it. We have Huggies and wet wipes and grandmas to help us out. Canine moms have to do a lot of their own work to keep their puppies fed and cleaned. So, Pippin had her hands—uh, paws—full with her four new beautiful babies. And that is where our story will end for now, dear reader. (Sorry, but there’s only so much I can manage to write out each time.) If you’re curious to know how many were boys and how many were girls, and what their “milk names” are, tune in for the next installment of this exciting adventure! Get the next puppy saga post sent right to you. Oh my gosh, congratulations Pippin! What a beautiful mommy! I’m so sorry about the poor little puppy :(. And what a night for the electricity to go out! But what an exciting time. I’m so happy for you. Thank you! I will pass on your congratulations to Pippin (in the medium of a head scratch :)). Yes, we are enjoying these little furballs! Thank you so much, Bernice! I also think Pippin is a very pretty dog and we are happy to have her in our family. I can’t wait to see what her puppies look like as they grow up. Wow! 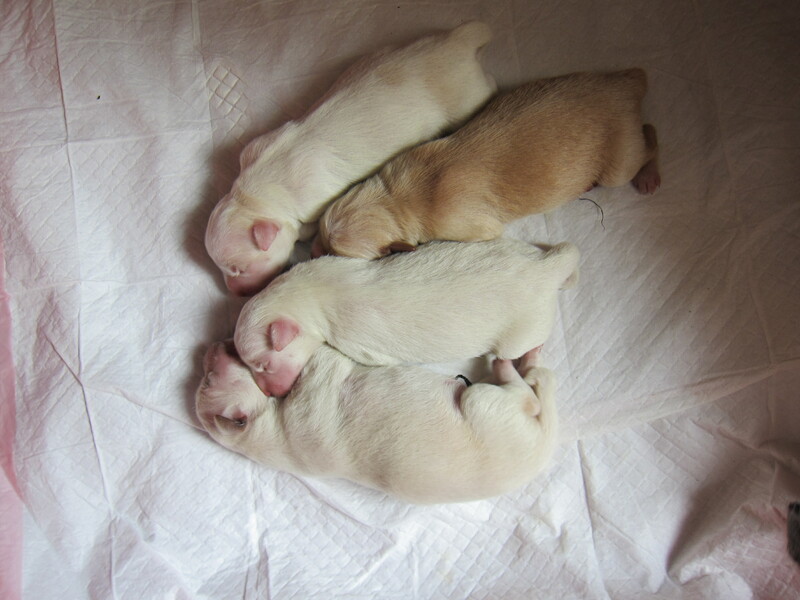 Four puppies! They are really cute 🙂 I hope that you can find good homes for all of them. Thank you! We hope the same.